Last week, in Pigs In Shtreimels, I reported on the war by the charedi gedolim against the new charedi college programs for girls. But there is another war that in some ways is even more disturbing - that against charedi high schools for boys. The latest front of this battle is in my home town of Ramat Beit Shemesh (as recently reported in Kikar Shabbos and Life In Israel). A few years ago, the charedi gedolim - Rav Elyashiv, Rav Steinman - came out against a charedi high school that opened in Ramat Beit Shemesh (see pashkevil at right). The school was eventually forced to move out of the city. It was around this time that Rav Steinman visited Ramat Beit Shemesh and said that there is no correlation between secular education and parnasah. Now, there is a new pashkevil circulating. It is not signed by top-tier gedolim, only by local Beit Shemesh Israeli charedi rabbonim who are very much on the extreme right end of the spectrum. This one targets Mesivta Beit Shemesh and Meorot, which are charedi high schools offering full secular education and bagruyot. But it also mentions Arzei Levanon, which is a yeshiva ketana rather than a high school, and which follows the directives of the gedolim in not offering bagruyot in the framework of the yeshiva, but which offers electives in carpentry, math, karate, music, English, and so on. 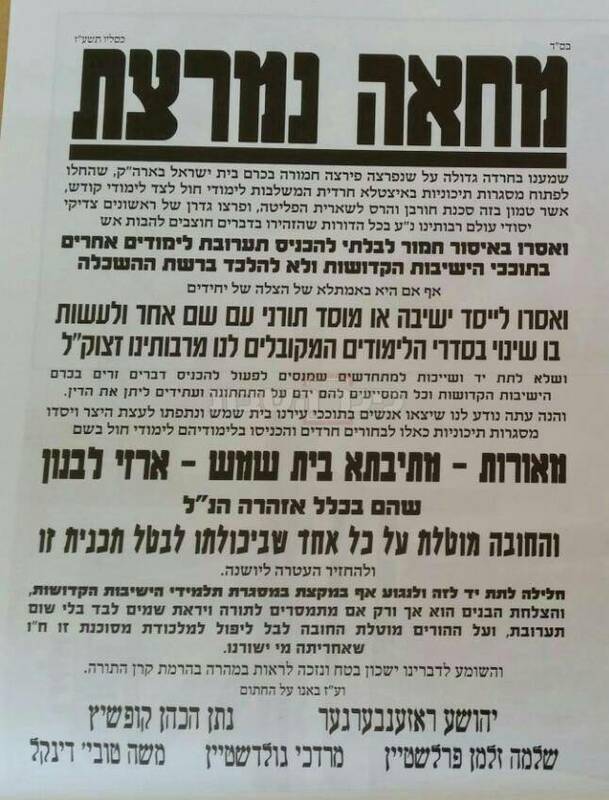 It should be noted that Arzei Levanon is specifically backed by charedi rabbonim who oppose high schools, but this does not suffice for the chareidi rabbonim at the even more extreme end of the spectrum. Yes, it is an unavoidable reality in chinuch that boys who have particular, specialized needs must have those needs addressed. And these may in fact include a secular studies program in a boys' high school. Yet most of the mainstream chareidi Anglo rabbanim in RBS, of which I am one, remain opposed to creating such schools for the general public as a typical, standard option. It is against the wishes and guidance of our gedolim in Eretz Yisrael, and we are their faithful representatives. And indeed, the majority follow that guidance. Sure, many parents making aliyah find it hard to wrap their heads around their son not even getting a high school diploma during his teenage years (gasp!). But having personally researched the matter extensively, I assure them that opportunities abound for eventual "catch-up" and beyond. One who decides at some later point to enter the workforce can find numerous and varied programs geared to their specific desires and aptitudes. I am willing to share this research with anyone desiring information. There is loads more (see http://taubcenter.org.il/he/haredim-in-higher-education-heb/ - N.S.). For those who don't want to slog through it all, the main point is that while there are many programs out there, the number of men who start and don't make it through the mechina programs, plus those who don't make it through the course programs comes to around a 70% failure rate- as documented by the programs themselves. On top of that, there are thousands of others who don't even try to start a program because they know that they won't succeed due to various life circumstances. To try to convince people to send to yeshiva ketana by telling them it's not a problem AT ALL to "just do it later on" is more than just misleading- especially since all the above evidence to the contrary is very well known to anyone who cares to look. Twelve years ago, many people in the Anglo charedi community in the US suddenly realized that due to the charedi rabbinic approach to science and rationalism, the charedi world was really not the place for them. 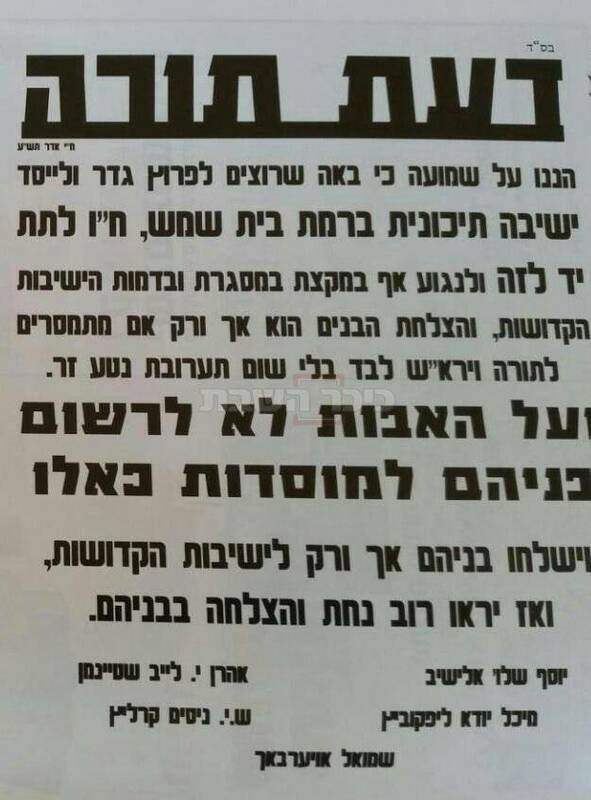 Now, many people in the Anglo charedi community in Ramat Beit Shemesh are waking up to the same thing, due to the attitude of the local Anglo charedi rabbonim to secular education. For most of these people, however, it is too late, since they are already embedded in the system. I am eternally grateful to the charedi gedolim for waking me up to this twelve years ago, which led to my wife and I putting our children in the non-charedi educational system, of which there are an abundance of wonderful schools in Ramat Beit Shemesh. Although our youngest, who just turned four, is still struggling with being in a Hebrew-speaking gan. The other day, he said to me, "Who is Auntie Ochus? Who is she?" Very sad. I actually understand your need to feel important, but honestly, the "thousands" of people who "woke up", all because of your " achievements", are lightweights who, like yourself, are unable to understand the deep concepts necessary when aspiring to be a noteworthy intellectual in the Torah world. It's better to be a lightweight anything than be a Charedi anything. So there's that. "Oy," I am delighted that despite the very low opinion that you have of me, you nevertheless follow my writings so closely that you comment as soon as my post is published! Perhaps one day I can inspire you to brave enough to give your noteworthy intellectual name along with your comment. Apparently being a noteworthy intellectual of the Torah world means you are unable to comprehend things that are quite easily demonstrated - such as the connection between education and income. Charediut is simply jewish flavored stupidity for the dumb masses. Plenty of people have already. "Who is Auntie Ochus? Who is she?" Why, Uncle Louis's wife, of course! Greek (west) vs aramaic (east). Though he (supposedly) was the Roman emporer's son. And yet Rav Malinowitz just came out with this letter. This is a significant event, since he is (a) American and (b) the leader of a supposedly "moderate" chareidi shul. Indeed. A lot of modern orthodox olim go to that shul, who would never have accepted that kind of statement from their Rov in America. Yet their children are now all in charedi yeshivos such as Reb Zvi's. 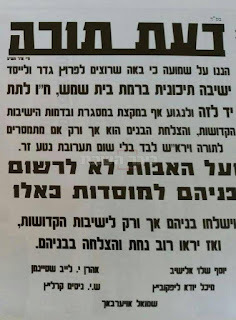 Many members of BTYA - where Rav Malinowitz is the Rabbi - have either left the Shul over the years, or dream of seeing him replaced with a Rav that aligns with their Torah im Derech Eretz Hashkafa.....or at the very least, a Rav with enough tact to not offend many of his constituents with public proclamations of Chareidi fealty, i.e. no secular HS education. R Malinowiz's shul is the LEAST moderate! Not sure what shul membership proves. All the shuls I have ever belonged to had rabbis who spouted moronic politics, racism or uber-simplistic attitudes to Torah study (they were orthodox after all). But I still go regularly to those shuls. What choice do you have? This war hasn't been going on for 30 years. It been 160 years - since R' Shmuel Salant, R' Y. L. Disking and R' Y. Ch. Sonnenfeld, all leaders of what has grown into the contemporary Haredi community of Jerusalem. They viewed the secular studies schools as the spear tip of Haskalah - as it often was. They were often founded by Maskilim to spread their philosophy. Remember that not all Maskilim were anti-religious. American Yeshivos in the Torah Voda'ath model are hardly exponents of any form of Haskalah. They view, and present, secular studies as strictly utilitarian. They are required to make a living, and to keep off the Government's truancy radar. (Maybe the order should be reversed!) This is what is being proposed in RBS and the other places in Israel. The Haredi Gedolim and their apparatchiks, however, continue to fight the battle of more than a century ago. As an aside, I saw, in a Lakewood Yeshivah that also hosts weddings in their great hall, the corridors were decorated with replicas of the pashkevilim posted a century ago when the battle flared anew in response to a British attempt to impose educational standards at the onset of the Mandate. Putting the difficulty of catching up aside. It still apologetics. The Gedoilim don't want anyone doing a catch up later either, so the whole point is moot. Put out a pashkeville that R Malinowitz is pro allowing kollel guys to do tashlumei bagruyot and we'll see a whole new letter with anew angle. This is the reason why thousands of main stream Chariedi families in America have not even for a moment considered making Aliyah. There are a huge number of chariedi Americans who's children are colleges and vocational training. Yeah, because God forbid someone should make Aliyah and just, you know, pick a community that's comfortable for them and a shul they like davening in and a school that's good for their kids. I never got this argument: I moved here, did what felt best, and am choosing schooling based on what's best. This compulsion to conform and listen to a gadol is really something I can't grasp. R. Chaim Malinowitz is an articulate conservative (small c) halachic voice in a hostile public sphere. He is a heavyweight scholar and Talmid Chacham, whose views must be reckoned with seriously. And he probably feels, with justification, that much of what passes for "education" in schools today is total nonsense. Nevertheless, he errs in thinking that high school and post HS education, such as it is, can easily be dispensed with. Yes, the exceptionally bright, aggressive, or connected can succeed in the business world without a degree. But for the average individual - including doctors, lawyers, and accountants - education is necessary. In today's age such education is basically a component of learning a trade. As for the claim that "Twelve years ago, many people [began to realize] the charedi world was really not the place for them" - I wish you realized how off-putting such arrogance sounds. It's a common refrain in all your writings. The concept that you personally choose to call "Rationalist Judaism" did not begin twelve years ago, and it did not begin with you. Nor are you the only exponent of it. To even imply that would only undermine the whole approach to begin with. R. Aryeh Carmel, whom you claim as a mentor, reached tens of thousands through his books a generation ago, and he never once was arrogant enough to suggested he was "starting" something. He was simply articulating an approach that has always existed and has always had adherents. There were others before him, after him, and at the same time as him. Please remember that. DF, what on earth are you talking about? I certainly didn't invent rationalist Judaism, nor was implying that I started anything. It was the Gedolim that did something twelve years ago which made many people realize that the charedi world was not for them. I can't take any credit for it! "He is a heavyweight scholar and Talmid Chacham, whose views must be reckoned with seriously. And he probably feels, with justification, that much of what passes for "education" in schools today is total nonsense." DF, I feel for you. You've found that the modern world isn't quite what the Yeshiva world makes it out to be and you're struggling to square the circle. Your out seems to be that seems to be that political liberalism infects everything modern and makes it bad, while traditionalism really equal to the modern world minus liberalism. Unfortunately the ledgers don't balance and people really do acquire lots of important knowledge in high school, as you well know. "Yes, the exceptionally bright, aggressive, or connected can succeed in the business world without a degree. But for the average individual - including doctors, lawyers, and accountants - education is necessary." Agree 100%, but I would add that there are plenty of people not of a business bend who could do fine in high school and college and professional school, but are not brilliant enough to play catch up (e.g. do well on the LSAT without having done enough prior English). Some of the problem is that you will find the brilliant Talmid Chacham succeeding in medicine or law after a late start, and people then overgeneralize from there. I wish you realized how off-putting such arrogance sounds. It's a common refrain in all your writings. I think what Slifkin "lead" is the fact that the Gedolim are JUST PLAIN WRONG about many things, that their probity (intellectual integrity?) is suspect, and that we cannot rely on them outside of their purview - strictly halachic as opposed to haskofic opinions. "You've found that the modern world isn't quite what the Yeshiva world makes it out to be and you're struggling to square the circle. Your out seems to be that seems to be that political liberalism infects everything modern and makes it bad, while traditionalism really equal to the modern world minus liberalism"
actually the modern world is every bit as vacuous as it is imagined to be in the yeshiva world. i went to touro college with a bunch of yeshiva guys at night while learning in yeshiva during the day. my first real exposure to the intellectual level of the "modern world" was when i got to medical school. i was considered bright, but far from outstanding while in yeshiva, and my new class mates were the top 1% of american college graduates, many out of the ivy league. by and large they did not have the study habits to have been anywhere near the top 1% of bachurim in an average american yeshiva, but much more important they lacked the thinking skills. many where excellent scientists in the technical sense, but couldn't think their way out of a paper bag (excuse the expression). this was true of those who had majored in the humanities as much as those who had majored in the sciences. i came away convinced that a university education imparts a lot of information, but actually deadens the ability to think coherently. this impression was confirmed to me by non jewish professors as well. nothing that i have seen in the 17 years since graduating from medical school has shown me otherwise. a frum physician in RBS A.
RNS - Anyone with any knowledge of Jewish history whatsoever understands that your issue is no different than a thousand other cases before and since. R. Carmel's book was banned too, as you surely know, by R. Shach. As we speak there is a post on Seforim Blog about a fellow who ran into similar problems for casting doubt on the Chanukah story a hundred years ago. The eternal tug-of-war between mysticism and rationalism - or whatever names you wish to call them - is an old one. You are a gifted writer and a worthy exponent of the views you believe in, but don't make it about you. DF you appear to have very poor reading comprehension. Nowhere did R. Slifkin claim that it was about him. And of course it's true that there is a long-standing tug-of-war between mysticism and rationalism. But the so-called Slifkin Affair was still a major turning point for many people. Probably because whereas in the past, people in different communities had rabbis that matched their outlook, today many people follow rabbis from different communities who don't match their outlook. The Slifkin Affair brought that to the fore. "R. Carmel's book was banned too, as you surely know, by R. Shach." Which book of R. Aryeh Carmell was banned? I didn't think "Challenge" was on the radar of R. Shach("Sha'arey Talmud Torah" by Prof. Leo Levy I think wasn't about science). I believe Prof. Leo Levi had a sticker added to his "Vistas from Mt. Moriah"(1959) that it wasn't intended for yeshivah bachurim, and R Schwab advised against reprinting RSRH's letter on Science/Chazal per Dr. Lawrence Kaplan, so in that sense I agree it wasn't a new issue. Your experience is intriguing to me. I have almost the opposite experience with every frum man or woman I talk to. They have no ability to think about jewish texts in any sort of historic context and thus are unable to handle complex or critical considerations. you must have some sense of what I'm talking about, whenever you see an article by a frum rabbi arguing that midrashim are to be taken literally or whatever. and I'm not just talking about the rank and file or the more superficial sectarian warfare that goes on in the public sphere. I'm talking about having discussions with really well 'educated' haredim who have spent their entire lives in yeshivot. They are just unable to think historically or critically about the texts they study. I can see why humanities students (like myself) don't have the logic/analytic skills that gemoro students might have, but they do have the ability to think conceptually about what they are learning that yeshiva doesn't teach. And why would they? those thinking skills are not taught in yeshiva. but they are crucial for success in the outsid world. R. Carmel's book was banned too, as you surely know, by R. Shach. R. Shach had an itchy trigger finger. He called lots of people Apikorsim in including the Rav and the Lubavitcher Rebbe. This had no practical effect whatsoever. As we speak there is a post on Seforim Blog about a fellow who ran into similar problems for casting doubt on the Chanukah story a hundred years ago. Those are not comparable. Of course if you argue openly with the Gemara in that way, there will be backlash. The shocking thing about ban on R Slifkin's books is that they were attacked for things that lots of Orthodox people believe and even are taught in Orthodox schools in their secular studies classes. Everyone who grows up with a modicum of education understand that the universe is older than 6000 years and undoubtedly many Charedim believe this to be so. The fact that R Feldman felt the need to justify the ban and then published a justification with such obviously strained logic shows that something was a bit different about this one. Obviously you are right that we always magnify the importance of contemporary events and events that effect ourselves. That is true of everyone. "did not have the study habits to have been anywhere near the top 1% of bachurim in an average american yeshiva"
What sort of study habits, exactly, are required by a system that has no exams? DF: So you're basically admitting that he *is* the central character. I'm sure that as a physician, would agree that your comment is lacking in evidentiary value. It is anecdote mixed with subjective values judgements conforming to your admittedly pre-conceived notions, and thus liable to confirmation bias. Nevertheless, I would agree with the notion that the Yeshiva experience, for those who are successful in it, places a much higher premium on total immersion in study than the general university experience. This doesn't mean that the modern world is vacuous; it means that the Yeshiva does make certain demands that are useful to training people to work really hard in their intellectual pursuits. You seem to subscribe the false notion that to build up the values of a Yeshiva education, you have to tear down the alternatives. OTOH, while the Yeshiva curriculum, such at it is, does provide a lot of practice in legal reasoning, it is sorely lacking in both formal mathematical reasoning and in scientific reasoning. Anecdotally, I'm actually quite surprised at the level of unsophistication in these areas that I've found among respected Rabbis and intelligent Yeshiva "graduates". The most prominent example that comes to mind would be R Shmuel Kamenetzky's anti-vax position, but my experience (which is to say, an almost valueless datapoint) is that those who have spent time only in the Beis Midrash are sorely lacking in their understand of how the world actually works. To put a finer point on it, I would argue that to be reasonably educated scientifically, one should have been given a basic grasp of ideas like formal mathematical proof (which the G'ra seems to have recognized given his approval for the translation of Euclid by Rav Baruch of Shklov), Newton's laws, the law of supply and demand, probability and statistics just to name a few. These are things brought to us by the modern world (except for formal mathematical proof which was improved but not invented in modern times). I think you're likely right in saying that many(most?, all?) the medical students yuo encountered, and perhaps the physicians you encounter, although quite bright, lack the "thinking skills" of the best yeshiva bochurim. You extrapolate from here that "university education imparts a lot of information, but actually deadens the ability to think coherently. this impression was confirmed to me by non jewish professors as well. nothing that i have seen in the 17 years since graduating from medical school has shown me otherwise." It seems to me that you are extrapolating to the whole based on your experience with a very special and self-selected group: Medical Doctors, who while very capable and bright, generally tend to not be the types of people who are interested in ideas, nor the types who tend to be creative, nor the types who like to think deeply about things. Hence, their lack of "thinking skills" is only surprising to those who assume that being very smart and having good thinking skills go hand in hand. I would go further: IN GENERAL, the types who enjoy ideas, creativity, and intellectualism DO NOT go into medicine. And those who DO go into medicine are generally the LEAST likely group to tell you anything about the thinking skills of the very smart who apply their smarts elsewhere. So you're extrapolating from a highly self-selected group to the whole. Nachum - not at all, and I don't know how you would draw that inference. Everyone is exposed to something by *somebody*. When one is young and immature, that somebody, who served as the vehicle for one's exposure, has an outsized influence. But as we learn more, we learn to understands the person's true place in the scheme of things. Example: I was introduced to a more "academic" style of learning than I was taught in yeshivah by a chance encounter with a book by R. Reuven Margolios. I was hooked, and it changed my life forever. Even today I have a particular fondness for his many works, because he was the vehicle that broadened my horizons. But is he the only one with that approach? Of course not. He just happened to be the one through which I was exposed to it. That's exactly the case with our friend RNS. Certainly some people had their eyes opened to certain ills in the charedi community by his experience. But that doesn't mean there is anything special or unique about his story. It just means he served as the vehicle for their exposure. In other words, nothing at all special happened "twelve years ago." Other people were exposed to it "ten years ago" by the "Making of a Godol" debacle. And for others it would have been "six years ago" by the Lipa Schmeltzer concert ban. And so on and on. All of these incidents are felt very keenly by the protagonists involved, but to the outside observer, there is nothing particularly unique about any of them. DF - I don't see any evidence of Rabbi Slifkin ever claiming to be anything than the "vehicle for their exposure". His entire argument is that there's enormous support for his ideology in the traditional literature, not that he's creating anything new. His experience did happen relatively early in the age of the blog, though, and that timing made the Slikin Affair a much bigger cultural phenomenon than, say, Rav Schach's various pre-internet bans. @DF: Here is the original sentence: "Twelve years ago, many people in the Anglo charedi community in the US suddenly realized that due to the charedi rabbinic approach to science and rationalism, the charedi world was really not the place for them." There are no claims of uniqueness. 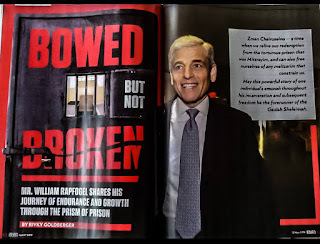 Nevertheless, R Feldman did write: "Probably the public issue most damaging to the honor of Torah and to its leaders in recent memory is what is known as the Slifkin affair." The fact that he responded at all meant that something a little different was up. You are correct that since no one has actually measured the effect, it is hard to say whether this is some kind of bias on the part of the various participants or a truly above-average occurrence. I believe that in 120 years the phenomenon known as 'rationalist judaism' will quitely disappear (vehameivin yovin) and the phenomenon known as 'non rationalist judaiam' will continue chai vekayom as it always has, each adherent in his own way. Is that your personal religion then? Yes, it's his Ani Maamin. Yeah, I can imagine someone writing the same exact thing about the Rambam in about the year 1200. Or about R' Yihye Kapach in around 1850. Or...I hope you get the point. We don't have a religion solely based on the Rambam, do we. The 'peer review' of traditional judaism has not selected him as the sole arbiter of halocho and hashkofo. Come on. Your exact word was "disappear." The Rambam has obviously not disappeared and is universally considered the greatest Jewish thinker and halakhic personality of all time (or at least in the past 1500 or so years), regardless of whether or not we follow the Shulchan Aruch or we can quibble with something here or there. Again, you said "disappear." By the way, to satisfy my curiosity, you're a British Charedi, right? Generally only they (and some trying-to-hard American charedim) do such violence to the kamatz vowel with the letter "o." Only a prophet should venture confident predictions about the future direction of Jewry. There is much ferment today and great polarization. On the one hand we find supposedly moderate Hareidi rabbinic figures inveighing against any secular education. On the other, we find some with Orthodox credentials questioning basic torah concepts. Rabbi Malinowitz exemplifies the former. He had written an approval of at least one of R' Natan's 'controversial' books and had, apparently, supported his congregant even after the bans were proclaimed. Yet, he has supported the Hareidi faction in Ramat Bet Shemesh, and has not criticized the violent actions of even their extreme elements. He has also not distinguished himself in handling abuse cases. His rightward evolution may be driven by ideology - if not expediency, but the direction seems obvious. When will the quiet objectors of such developments overcome their fear and openly proclaim that the current Hareidi leaders are driving their flock off a cliff instead of feeding them? You can review the prophesies of Ezekiel to see how he treats such leaders. 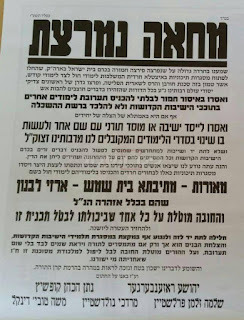 R. Malinowitz, like many Haredi Rabbaim of his "stature", simply ABSTAIN instead of casting their votes. Consequently, the fanatics' resolution passes, and all of Klal Yisrael loses. R' Slifkin, the chareidim should hold you up as the paragon of one who was able to successfully "catch up" despite the disadvantages they imposed upon you! Does anyone have the video where Rav Steinman said that there is no correlation between secular education and parnasah? 'He...feels, with some justification, that much of what passes for "education" today is total nonsense." What's being taught that's total nonsense? All Math? All Science? History? Computers? Languages and literatures? Have you ANY idea what you're talking about? He's probably referring to things like American students knowing more about, say, Japanese-American internment than Pearl Harbor. But that doesn't mean education is worthless. Auntie Ochus? She's married to Uncle Os, silly! You think no one has? 'Judaism's encounter with secular studies' book. Top notch. Articles by blidstein leiman r. Lichtenstein and one other whose name I forget please forgive me. I haven't read all the articles linked, but is it possible that they refer to standard Israeli chareidim, whereas Rav Malinowitz's 'extensive research' is talking about kids of olim who grow up in RBS in more open home, where there are secular books, discussions are more open, the wider family is often not chareidi at all, often there is enough money for extra chugim, and the chadarim in question are moderate enough to impart basic secular knowledge. To be fair, this tiny niche of Israeli society IS Rav Malinowitz's speciality. I happen to agree with Natan on this one, and particularly dislike Rav Malinowitz's 'gasp' comment putting down those who disapprove of his anti-common-sense approach, but for the sake of intellectual honesty, this would be interesting to discuss. I marvel that Chareidi leadership demand on the one hand absolute acceptance of Chazal's knowledge of science, and at the same time, ignore what Chazal say based on their own first-hand life experiences (such as the advice to work to support yourself). Is that because their statements about the natural world come from a mesorah that originated with nevua at Sinai? That's how Chazal knew pi to be irrational, after all (sorry to bring that up). Further, I suppose they figure that Rabbi Yehuda haNasi learned all he needed to know about commerce and Shmuel learned all he needed to know about medicine from that same mesora. Nonetheless, Rabbi Yehuda WAS a merchant and Shmuel WAS a physician. Is the idea to follow their example to the point where rather than only the elite learning full-time, its ONLY the elite who should be earning a living? Perhaps that's the case when you consider how many top-flight rebbeim have not merely secular educations, but advanced degrees--Moshe Meiselman and Avrohom Gordimer among them. Are they, too, opposed to secular education?